Garland is one of those great versatile dorm essentials that are ideal for dorm room decorating. Just like your dorm Christmas lights, this dorm necessities item can be placed around your college dorm room for cool dorm room decor. Plus, since this college supplies item is compact, you won't lose any of your dorm room space! Our Purple Foil Garland is a simple, yet pretty addition to dorm room decor whether or not it is the holiday season. 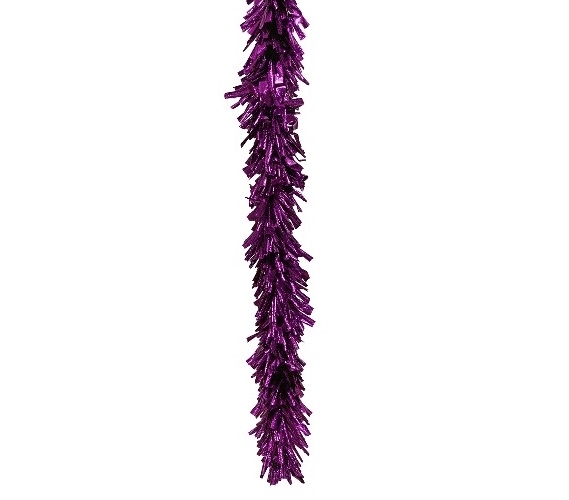 Featuring deep purple shining foiled tips in the garland strand, this dorm essentials item is sure to stand out in your dorm room decorations and create a cool and complete look for your dorm room decor. You can't have a dorm Christmas tree without garland. Well, you can but it won't have as much impact as a dorm Christmas tree with garland. Without garland, your dorm Christmas tree won't add much to your dorm room decorations. Our Purple Foil Garland will pull together your dorm room decorations on your college Christmas tree for a look that is cozy and complete. Of course, you aren't limited to placing our Purple Foil Garland on your college Christmas tree. We did say this dorm item was versatile, after all! You can extend your dorm room decor to your college dorm door and tape this dorm essentials item around the edges or in a cool design. You can even wrap our Purple Foil Garland around your dorm desk or other dorm items for extra dorm room decor!